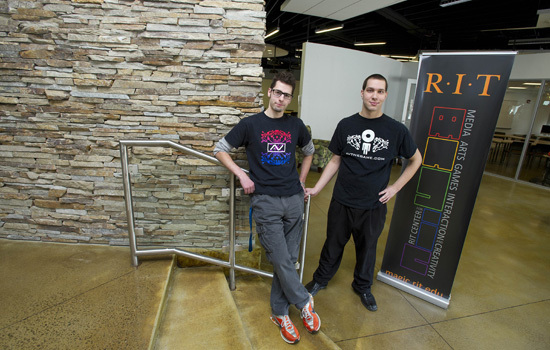 Game design and development graduates Doug Lynn, left, and Preston Johnson created the video game A.V., which will be released Feb. 13 on Steam. For the first time, Rochester Institute of Technology’s MAGIC Spell Studios has published a student-developed game on Steam, the world’s largest digital game distribution platform. The team plans to showcase it at the nation’s biggest gaming conference next month. Created by 2014 game design and development graduates Preston Johnson and Doug Lynn, A.V. 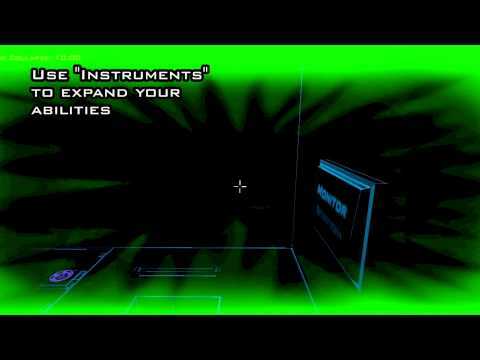 puts players inside a hostile computer world where they must solve puzzles and avoid detection to survive. The game blends elements of the music, puzzle, stealth and adventure game genres and will be released Feb. 13 for $6.99 on PC, Mac and Linux systems. An additional 15 percent discount will be applied until Feb. 20 to celebrate the game’s launch. The Media, Arts, Games, Interaction and Creativity Center was established by RIT in 2013 to help bridge the gap between university research and commercial production. MAGIC consists of both a research laboratory and MAGIC Spell Studios, which handles the publishing and distribution of its projects. MAGIC Spell Studios will showcase A.V. at this year’s Game Developers Conference in San Francisco, which runs March 2–6. The MAGIC booth opens March 4 and will also feature several other games currently in development at the studio. The commercial release of A.V. represents more than a year and half of hard work, determination and risk-taking by Johnson and Lynn. A.V. was originally conceived in the fall of 2013 as Johnson and Lynn’s graduate capstone project. The partners came up with the idea for the game by listing dozens of game elements that they wanted to explore. Eventually, they narrowed their list down to puzzles, stealth, music and light and fused these elements together to create A.V. Johnson, who grew up in Erie, Pa., and Lynn, a Central Square, N.Y., native, successfully completed the project and graduated the following spring. But even though they had finished school, they wanted to continue working together on A.V. because they knew it had the potential to be something special. Luckily for them, RIT had recently opened the MAGIC Center. The duo also needed to acquire enough funding to work on the game full time. So they launched a month-long Kickstarter campaign in July with the goal of raising $5,500 to cover their development costs. It came down to the wire, but ultimately the campaign was successful and generated a total of $5,654. With the backing of MAGIC and funding from Kickstarter, Johnson and Lynn were finally able to enter the commercial production process. They constructed new levels, enemies, challenges, music and more, effectively doubling the size and scope of the original game. Word spread around RIT’s School of Interactive Games and Media, and Johnson and Lynn brought in several students to contribute to specific parts of A.V., including 3D models and artificial intelligence programming. They also held events to let students “playtest” the game and used their feedback to make improvements to their designs. Following the release on Feb. 13, the partners will keep working on A.V. in order to add support for the Oculus Rift virtual reality headset, a feature they promised in their Kickstarter. After that, the partner’s futures will most likely diverge. Johnson would like to keep working as an independent game developer but he is waiting to see how well A.V. performs on the market before he makes his final decision. Lynn, on the other hand, desires to move into the more traditional workspace and focus on his passion for game design.